Autograph Letter Signed, “J. Marshall,” one page, quarto, undated. To Walter L. Fontaine. In 1816, while Chief Justice, Marshall sold 421 acres of land to Walter L. Fontaine for $4,215, with a schedule of payments covering 1817 to 1835. This may relate to that transaction. Marshall was the fourth Chief Justice and the longest serving one in history; he was Chief Justice for thirty-five years, from 1801 until 1835. His court shaped American Constitutional law and made the Supreme Court a center of power. 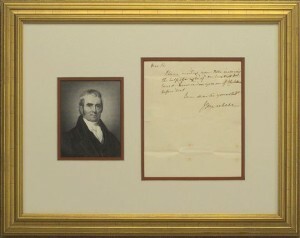 Framed in ivory and cinnamon, with a bust-length engraved portrait. Framed dimensions: 19 inches wide by 15 inches high.